Remove shell and ready to eat. Consume soon after opening. Ingredients: Sunflower Seeds (95%), Sugar, Salt, Brown Sugar (0.858%), Sweetener (E950, E954, E955), Flavouring. 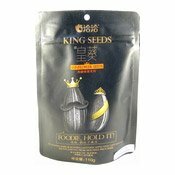 Simply enter your details below and we will send you an e-mail when “King Seeds Sunflower Seeds (Brown Sugar) (洽洽皇葵瓜子 (黑糖))” is back in stock!